Don’t miss two veteran singer/songwriters on stage together in an intimate performance. 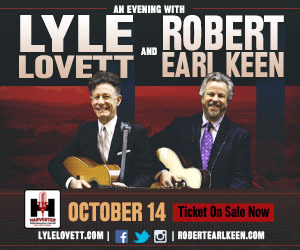 Lyle Lovett has broadened the definition of American music in a career that spans 14 albums. Coupled with a gift for storytelling, this Texas-based musician fuses elements of country, swing, jazz, folk, gospel, and blues in a convention-defying style that breaks down walls. Since his self-titled debut in 1986, Lovett has evolved into one of our most vibrant and iconic performers. Among his many accolades—including four Grammy Awards—Lyle was given the Americana Music Association’s inaugural Trailblazer Award, and was named Texas State Musician. His works, rich and eclectic, are some of the most beloved of any artist working today. Robert Earl Keen has marked his decades long career with a sharp insight into human nature, infectious melodies and a love of the road. Indeed, one of his first songwriting efforts became his calling card. “The Road Goes On Forever” is a perennial crowd favorite, and has understandably seen its share of cover versions.